Thank you for all your entries! 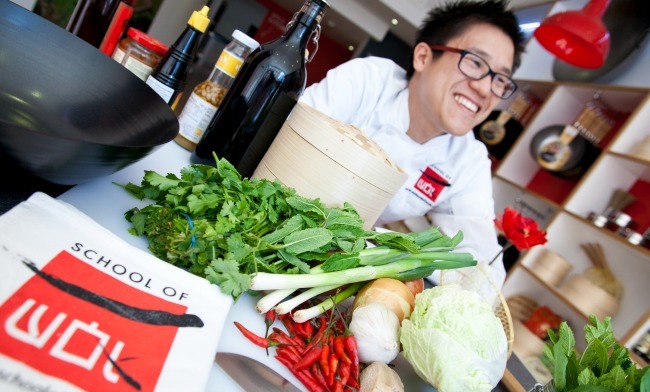 The winners are 1st prize to jamielmdjs@ – a three hour cookery class at School of Wok in London. 2nd prize of a School of Wok branded wok to mandyfluffybunny@ Congratulations, we’ll be in touch! Today we launch an exciting competition with one of our award-winning cookery schools – School of Wok, so read on for details on how to enter and catch our interview with Head Chef Jeremy Pang. What inspired your interest in cooking? I come from a long line of great eaters, but also great cooks, bakers and chefs. Both sides of my family have history and experience within the food industry and I’m proud to say I now own a school just minutes away from the Chinese bakery once owned by my grandfather. But my biggest inspiration for cooking was the love and passion my dad always had for it. He started me and my sisters at an early age, getting us to try different ingredients when cooking for us or when we travelled. It’s so exciting to be following his dream of becoming a chef. What is your favourite type of cuisine to cook? Chinese of course and Thai! What is your favourite food to eat? That depends on where I am really, and if I have to cook it. I love Singapore-style chilli crab, it’s one of my signature dishes, but I’m equally easy to please with a great steak with chips. What basic tips would you give to a beginner in the kitchen? Organise yourself and your ingredients first! We teach a method called the ‘wok clock’ at the school, which really helps get you set up to cook. Get all your ingredients chopped up, marinated, mixed etc. then arrange it clockwise on a plate, in the order you use it. It makes the actual cooking part pretty simple, and so much more fun when you’re not worried about what comes next. What is the secret to good cooking? For good cooking you want to be relaxed so you enjoy the process, fully prepared (as I mentioned earlier), and have paired together a nice balance of flavours. You can create amazing flavours with just a few ingredients too. Are there any Red Letter Days experiences that you would love to try? The Sunrise Champagne Hot Air Balloon Ride for Two sounds fun, I’m sure my wife would like something like that. Anything that involves eating where I’m not cooking also sounds pretty good. Not that I don’t love to cook, but it’s always a treat when someone else cooks for you. Compete to WIN a three hour cookery class at School of Wok in London, or the second prize of a School of Wok branded wok, by simply telling us your favourite dish to cook in a comment below (remember to include your email address)! Competition closes at midnight on Sunday 1st March and will be announced next Monday. images supplied by The School of Wok. I like to make lasagna - a lot of put it and leave it, but with an impressive result! I love making a creamy soup, it's a great way to pack in your 5 a day when you're feeling under the weather! I like making homemade chicken and mushroom pie ! I love making thai green curry, I absolutely love thai food and this is a favourite I can make at home - so quick and easy to make too. Would love to learn how to master the wok. I love making Jeera Chicken with Chapati's and a simple tomato/red onion salad with a lemon dressing. I've ben making a lot of Mexican inspired dishes lately. It's the warm spices in winter that work so well. I love (to attempt) cooking Asian food. Picking just one dish is really really really hard but at the moment if pushed I would have to say beef pho. Beef seared rare on the pan with the juices poured into a big bowl of soup, filled with spices, sweet, salty, sour and spicy flavours. Loads of crunchy vegetables and some Chinese soup noodles cooked and served in the broth. YUM!!! My favourite dish to cook is toad in the hole, with mashed potatoes, greens and gravy. Will defeat even the coldest winter nights! My favourite dish to make is beef goulash casserole dish with creamy mash potatoes! Very filling and utterly delicious. I like to cook Indian food, especially dosa, idly, sambhar. It's jsut a pity it takes hours to make and then just minutes for the family to scoff it all! I like to cook salmon fillet with pesto and green beans served with new potatoes. It would be followed by homemade chocolate cake. This is mainly because it is the only thing I know how to cook well! I like cooking pasta dishes! Spaghetti Carbonara. Easy to cook and tastes delicious. My favourite dish to cook is Pad Thai. It always goes down well! I love to cook jerk chicken, yam, sweet potatoes and plantain. I like to cook paneer makhani and many other indian dishes. Pastas and stirfry too. My forte has to be Thai Green Curry. Although I make it Thai-level hot and have reduce several people to tears but they still carry on eating! I am enjoying learning to cook the basics right first like soup, fish pie, omelettes though I want to try my hand at Japanese recipes as I love the food from there and find it makes me fuller then other cuisine. Mexican chilli bean stew with nachos and enchiladas. My favourite meal? quick cook - pan fried salmon and stir fry vegetables: slowcook - Ox cheek casserole. I make a mean Sweet and sticky slow roasted belly pork ribs, bubbling juicy and tender. Think I might go make some now. I love cooking garlic and pancetta pasta tossed in chilli oil. Simple, but super yummy. I love to throw things into the wok and experiment. Every week I buy meat and vegetables and I toss it whatever I fancy! I do usually go for ready made sauces and would love to learn the skills of creating these from scratch. My favourite dish at the moment is Stir Fried Hoisin Pork with Red Pepper - though I'm still trying to perfect the steamed rice! I make a great walnut bolognaise. Superb for dinner parties with a vegetarian. Crispy shredded chilli beef, closely followed by pancake rolls which are amazingly easy to make at home. I'm a big fan of risotto. Chilli Beef Stir Fry - healthy and when I have a cold the spices do me a wonder of good! I love making soups, I make about 1 soup every day. I love a good stir-fry, it's a great way to clear out any veg or meat left in the fridge. Quick and tasty. I love the routine and getting the timing right of the great british full english breakfast! Personally I love cooking a big roast dinner with all the trimmings. Recently I've been dabbling with homemade pizza. Not perfect yet so more work to do. I love attempting Chinese - particularly a curry - but I am not great at it yet. Need some help! Lasagna - so easy to make but always yummy and impressive! Our favourite food is thai, so my favourite dinner to cook has to be Chicken with Oyster mushrooms over steamed rice.... mmmmmm. Beef wellington, I don't cook this a lot but when i do I like to cook from scratch even the pastry and it is divine.